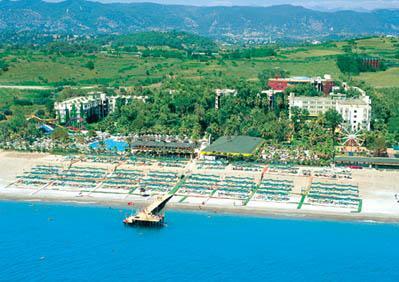 Situtated in Alara, Alanya is just 32, Side 30 km and Antalya airport 90 km away. 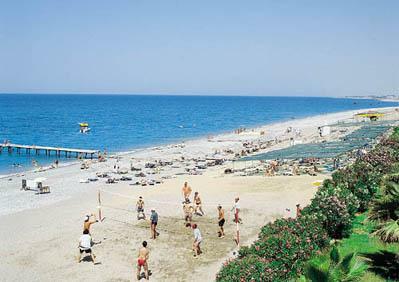 Free shuttle bus to Alanya, Manavgat and Side (daily). Reception * lobby * main restaurant with non-smoking section and terrace * 5 a la carte restaurants * bars * 2 pools * aquapark with 2 slides * 2 kids pool * conference rooms * open-air cinema * disco. 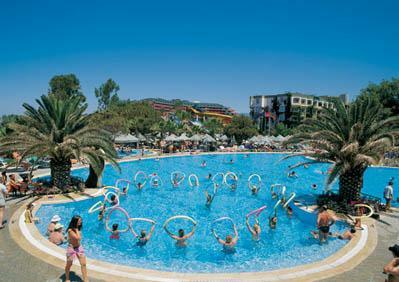 2 tennis courts, darts ,table tennis, beach volleyball, aerobic, water ball, water gymnastics, surf (licence required), canoe, Turkish bath, sauna, jacuzzi, fitness. 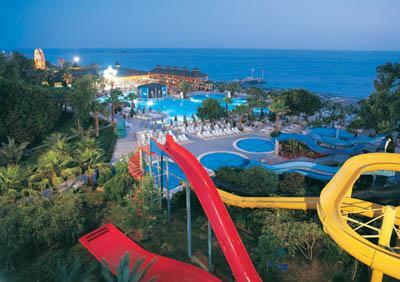 Children buffet (in the evening), animatins, kids club (4-12 age), buggys, disco and cinema, playground. Floddlight and tennis equipment, tennis course, billiards, motorized water sports, internet café, computer games, massage. Air-conditioning (central) * balcony * minibar (daily refilled) * satellite TV * bathroom with hairdryer * telephone * safety box * carpet. Situated on the long wide sandy/pebbly beach. Pier. Beach bar. Sunbeds, umbrellas, mattresses and beach towels available free. Unlimited soft and alcoholic local drinks between 10.00 -24.00, on disco till 02.00. Open buffet breakfast, lunch & dinner, late breakfast, in the afternoon snacks, ice cream, coffee/cake, midnight snack. On Sunday brunch. A la carte restaurants for dinner (reservation required).